Steve Lomas has signed the midfielder after he impressed in two warm-up games. 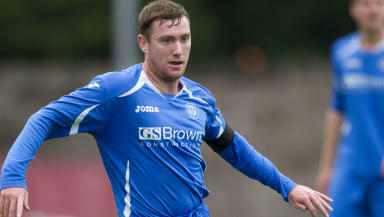 St Johnstone manager Steve Lomas has added to his squad ahead of their European adventure after sealing a move for Patrick Cregg. The 26-year-old has signed a one-year deal with the club after impressing in two warm-up matches over the past week. Cregg will be well-known to fans having enjoyed spells with Falkirk, Hibernian and St Mirren.The Dublin-born player first came to Scotland in January 2006 on loan from Arsenal. Cregg was a key player for the Bairns under John Hughes before departing the club in 2009 to move to Hibernian when Hughes was appointed as manager at Easter Road. A loan spell at Morton led to a move to St Mirren where he stayed until the summer of 2011. An unsuccessful season with Bury followed with the Irishman only making eight appearances. “Patrick ticks a lot of the boxes I am looking for. He’s a good age and feels he has something to prove. He does the simple things well in the middle of the park and deserves his chance.